Knowledge base | Multi-touch solution for spherical display. Globus (Erdkugel) is the multi-touch domed (sphere) screen. 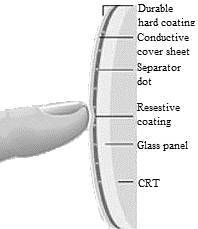 A capacitive touch screen panel consists of an insulator such as glass, coated with a transparent conductor. As the human body is also a conductor, touching the surface of the screen results in a distortion of the local electrostatic field, measurable as a change in capacitance. In this basic technology, only one side of the insulator is coated with a conductive layer. A small voltage is applied to the layer, resulting in a uniform electrostatic field. When a conductor, such as a human finger, touches the uncoated surface, a capacitor is dynamically formed. The sensor’s controller can determine the location of the touch indirectly from the change in the capacitance as measured from the four corners of the panel. Capacitive touchscreens provide: accurate drift free operation that is unaffected by temperature, humidity and can be operated by gloved fingers even in battery powered equipment. • Can be used through a glass window. 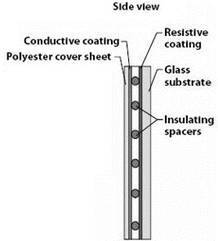 A PCT screen consists of an insulator such as glass or foil, coated with a transparent conductor – sensing (Copper, ATO, Nanocarbon or ITO). 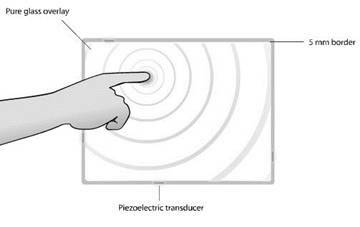 As the human finger (is also a conductor) touching the surface of the screen results in a distortion of the local electrostatic field, measurable as a change in capacitance.Now PCT used mutual capacitance, which is the more common projected capacitive approach and makes use of the fact that most conductive objects are able to hold a charge if they are very close together. If another conductive object, in this case a finger, bridges the gap, the charge field is interrupted and detected by the controller. 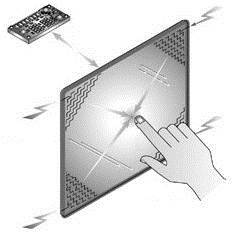 All PCT touch screens are made up of an electrode – a matrix of rows and columns. The capacitance can be changed at every individual point on the grid (intersection). It can be measured to accurately determine the exactly touch location. • Sensor does not use any moving parts. Applying voltage to the array creates a grid of capacitors. Bringing a finger or conductive stylus close to the surface of the sensor changes the local electrostatic field, the electronic circuit sees a capacitor formed by the activated electrode “x” and the series facing electrode “y” with the capacity of the human body. Since the capacity of the human body is very great with respect to the capacity value of each capacitor formed of two electrodes “y” and “x”, the electronic circuit has approximately a capacity the value of which is that of the capacitor formed of the electrodes “y” and “x”, the capacity value of the human body being negligible in the calculation of the value of the total capacity. By scanning with the assistance of the known electronic device the different pairs of capacitors and detecting the one having modified the natural frequency of an isolator which is associate therewith. To get an exact coordinate, the results from several row/column intersections are read and the counts used to triangulate the exact touch location. The Near Field Imaging (NFI) instead of sensing the change in capacitance (like PCT) it looks for changes in an electrostatic field. The NFI system generates a weak modulated electrostatic field in the front layer of acryl or glass surface. With an NFI capacitive touch screen, an electric field is created on conductive bars within the active portion of the touch screen. 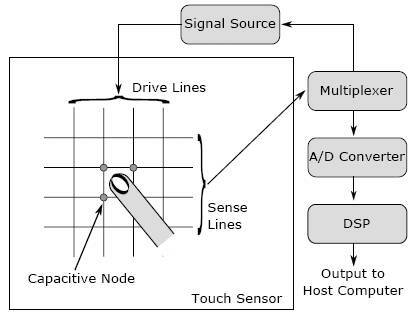 When an object, such as a user’s finger, comes in close proximity to the active area of the touch screen, it causes a modulation of the electric field, which is sensed by a controller connected to the conductive bars. 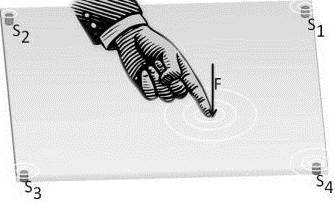 By analyzing the modulation of the electric field, a location of the contact on the touch screen can be resolved. NFI screen consist of two laminated glass sheets with a patterned coating of transparent metal oxide between them. The Interactive Surface Technology (IST) is constructed of a flexible, polyester layer that can be laminated to the front or to the back of any surface, or applied to a contoured surface. The substrate for lamination can be Plexiglas, polycarbonate, plastic, glass, laminated glass or any other non-conductive surface. In addition, IST can support “on display” use with LCD panels or “off display” use creating touch pad or button interface designs not using a display. ITO electrodes added inside the LCD cell (sometimes called “pressed capacitive”). Pressing the LCD changes the dielectric constant of the liquid crystal, which changes the capacitance between the electrodes. Works with finger or stylus. 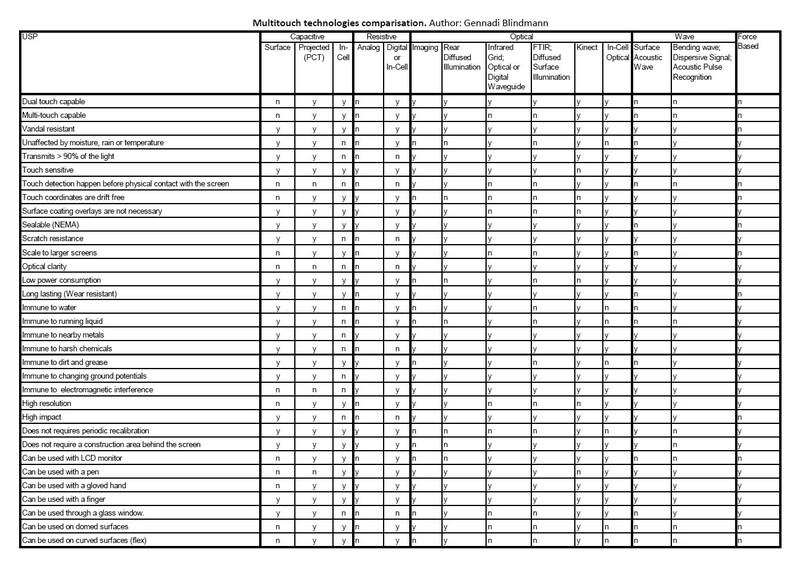 Human body capacitance isn’t a factor. On-cell:Projected-capacitive X-Y electrode array added on top of the color filter glass, under the top polarizer. It is the same as standard projected-capacitive. It works only with finger, because human body capacitance changes mutual capacitance between electrodes. Cover-glass (~0.5 mm) can be added on top of polarizer to protect LCD surface. • Cannot be used through a glass window. 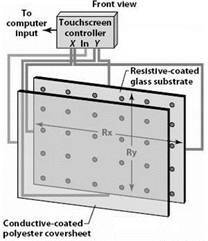 The resistive touchscreen is a contact-sensitive operating element, which consist from two glasses or plastic films (X and Y plate). Each of them is coated with a transparent resistive and conductive layer of metal that are separated by dielectric spacers, for example by an air gap. Usually it is Indium Tin Oxide (ITO), Antimony Tin Oxide (ATO) or Carbon Nanotubes (Nanocarbon) like by PCT. The X-plate is excited by the supply voltage. On touch, the two conductive plates come together and creating a resistor divider along the X-plate. The specific voltage at the point of contact, which represents the position on the X-plate, is sensed through the electrode on the Y-plate. 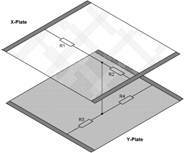 The process is then repeated by exciting the Y-plate and sensing the Y position through the electrode on the X-plate. On this way a touch controller senses the voltage changes in the “X” and “Y” direction. The controller sends a signal identifies the touch location to the Operation System (OS). The resistive touchscreen can be operated by touching it lightly with your finger or stylus. 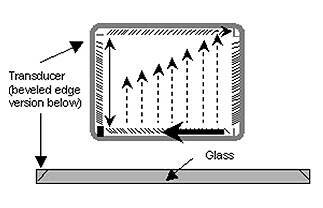 • Film to Glass = double layer of film and glass. • Glass to Glass = double layer of glass and glass. Digital Resistive technology pressing LCD surface closes micro-switches in each pixel and uses a pre-determined specific touch area (cell). Several x axis electrodes are specified on the upper X-plate and Y axis electrodes on the lower Y-plate. Junctions of the X axis and Y axis electrodes form specific cells (touch areas) for use as input button. Digital Resistive technology responds with Yes/No signals like a switch, determining whether upper and lower electrodes are connected. The upper and lower electrodes will be connected by pressure if user touched this area. The Digital Resistive technology consists from two layers, each with a conductive coating on the interior surface. Special dielectric (“Insulating”) spacers are distributed evenly across the active area and separate 2 conductive interior layers: conductive and resistive coating. The pressure from using finger or stylus produces an internal electrical contact at the touch point which supplies the controller with vertical and horizontal analog voltages for data input. In-Cell: Resistive technology has the similar principle as emerging “digital resistive” touch technology. 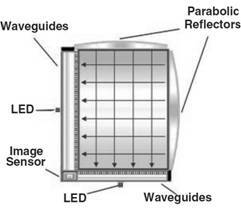 Multiple optical sensors track the movement of an object close to the surface by detecting the interruption or reflection of (IR) light source, which is emitted in a plane across the display surface and can be either active (IR LED) or passive (special reflective surfaces). 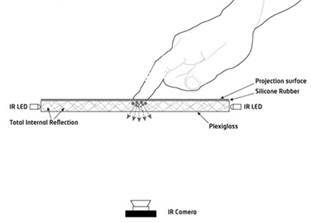 The (IR) light source and optical sensors of the touch screen are synchronized using a sophisticated algorithm that also reduces the effect of ambient light, thus creating a very clear, accurate touch selection.Touch occurs when a finger or object interrupt or reflected the light from the cameras. The controller board received signals from the optical sensors, compensates for optical distortions and triangulates the position (X,Y coordinates) of the touching object with extreme accuracy. 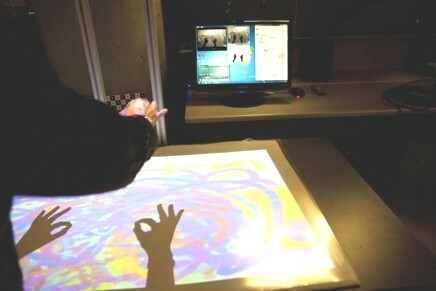 Optical imaging technology provides touch sensitivity over the whole screen. The Rear Diffused Illumination touch technology uses fact, that Infrared light is shone from the opposite side of the touch surface. When an object interrupted the infrared light it reflects the light back to the camera and creating a blob. An infrared camera is pointed at the touch surface and detects when fingers touch the surface. 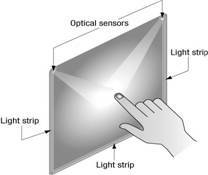 Infrared light is used to distinguish between a visual image on the touch surface and the fingers being tracked. The camera is connected to a computer and a tracking driver uses the camera image to track and create touch coordinates. The same Opto-Matrix technique is used by Infrared Grid, Digital Waveguide Touch (DWT)™ and Infrared Optical Waveguide technologies.Opto-Matrix relies on the interruption of an IR light grid in front of the display screen. 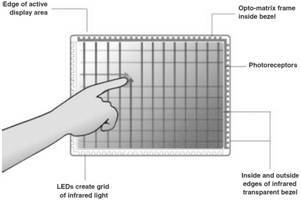 The touch (opto-matrix) frame contains a row of IR-light emitting diodes (LEDs) and photo transistors. Each mounted on two opposite sides to create a grid of invisible infrared light. The frame assembly is comprised of PCBs on which the opto-electronics are mounted and are concealed behind an IR-transparent bezel which shields the opto’s from the operating environment whilst allowing the IR beams to pass through. 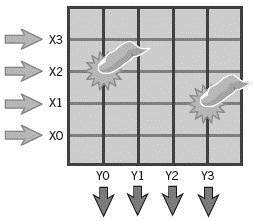 When touching the screen one or more of the beams are obstructed resulting in an X and a Y coordinate being sent to the control electronics to indicate the exact touch point.DWT is based on the interruption of invisible light beams and needs no touch panel overlay. The same method is used by Frustrated Total Internal Reflection (FTIR) and Diffused Surface Illumination (DSI).This method uses this to great effect, flooding the inside of a piece of acrylic with infrared light by trapping the light rays within the acrylic using the principle of Total Internal Reflection. Total internal reflection is an optical phenomenon that happens when a ray of light strikes a medium boundary at an angle larger than a particular critical angle with respect to the normal to the surface. If the refractive index is lower on the other side of the boundary, no light can pass through and all of the light is reflected. When the user comes into contact with the surface, the light rays are said to be frustrated, since they can now pass through into the contact material (usually skin), and the reflection is no longer total at that point. In case DSI special acrylic uses small particles that are inside the material, acting like thousands of small mirrors. When you shine IR light into the edges of this material, the light gets redirected and spread to the surface of the acrylic. 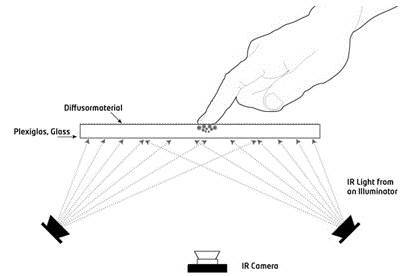 These measurements clearly show that the motion and gesture detection using Kinect simply would not work on a surface of a spherical screen as the precision is not high enough and the view of the camera is too narrow for a half-sphere screen. Photo-sensor in each pixel or group of pixels sees shadow of finger in bright light or reflection of backlight on finger in dim light. A key element in the construction is a device known as a retro-reflective optosensor. This is a sensing element which contains two components: a light emitter and an optically isolated light detector. It is therefore capable of both emitting light and, at the same time, detecting the intensity of incident light. 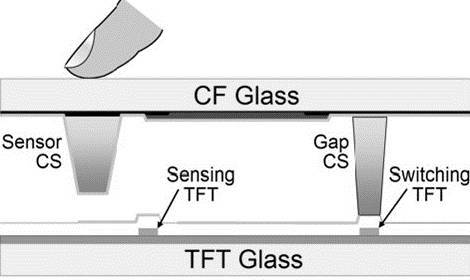 If a reflective object is placed in front of the optosensor, some of the emitted light will be reflected back and will therefore be detected.It is based around a 2D grid of retro-reflective optosensors which are placed behind an LCD panel. Each optosensor emits light that passes right through the entire panel. 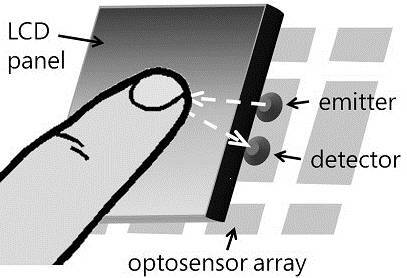 Any reflective object in front of the display (such as a fingertip) will reflect a fraction of the light back, and this can be detected. By using a suitable grid of retro-reflective optosensors distributed uniformly behind the display it is therefore possible to detect any number of fingertips on the display surface. The raw data generated is essentially a low resolution grey scale “image” of what can be seen through the display in the infrared spectrum. By applying computer vision techniques to this image, it is possible to generate information about the number and position of multiple touch points. An array of retro-reflective optosensors is placed behind an LCD. Each of these contains two elements: an emitter which shines IR light through the panel; and a detector which picks up any light reflected by objects such as fingertips in front of the screen.A critical aspect of this technology is the use of retro-reflective sensors that operate in the infrared part of the spectrum, for a number of reasons:- Although IR light is attenuated by the layers in the LCD panel, some still passes right through the display.This is unaffected by the displayed image.- A human fingertip typically reflects around 20% of incident IR light and is therefore a quite passable ‘reflective object’.- IR light is not visible to the user, and therefore doesn’t detract from the image being displayed on the panel. Surface Acoustic Wave (SAW) touch technology uses fact, that the waves are spread across the screen by bouncing off reflector arrays along the edges of the overlay and are detected by two “receivers”. The coordinates are then determined by the controller circuitry that measures the time at which the amplitude declines. Piezoelectric transmitters on the sensor generate acoustic waves on the surface on alternating X-axis and Y-axis patterns. This waves are reflected by a pattern of edge ridges directing the energy to piezoelectric receivers. A touch to the surface of the sensor causes attenuation to a part of the wave corresponding to touch position. Touch location is based on the time delay from the transmitted pulse to the center of the attenuation area of the wave. The same Bending wave technique is used by Acoustic Pulse Recognition (APR) touch and by Dispersive Signal Touch (DST). Bending wave (BWT) works by recognizing the vibrations created when the surface is touched and based by measuring the mechanical energy (bending waves) within a substrate created by touch of surface. When the touch implement impacts the surface, bending waves are induced that radiate away from the touch location. As the wave travels outwards, the signal spreads out over time due to the phenomena of dispersion.Piezoelectric sensors positioned in the corners on the backside of the surface convert this smeared mechanical impulse into an electrical signal. The further away the touch point is from the sensor, the more the signal is smeared. The “smeared” signals are then interpreted by a complex set of algorithms to precisely pinpoint the exact touch location on the screen.BWT is a passive technology, waiting for a signal created by a touch impact. The sophisticated and optimized controller that continuously monitors for a touch impact. The basic operational principle is a calculating the touch coordinates of the applied force of a user’s touch or gesture. The force based touch technologies applied touch force is used for determining the touch coordinates. Controller will, and must, also accurately know the magnitude of the user’s touch at any given moment of time. The system output is therefore based on 3-variables; x- and y-coordinates and the “z-coordinate” (force level). The technical design of a force based touch system must allow for a close-to-frictionless movement in the perpendicular to x-y plane (the z-plan) to ensure that the complete force (F) of the touch is directly transferred to the force sensors.For example: a system based on four sensors S1,S2,S3,S4 has the touch force F = FS1 + FS2 + FS3 + FS4. As the location of the four force sensors is known, the exact coordinates of the touch coordinates can easily be calculated. Interfering forces can be allowed (like by other technologies) for, as long as they are known, repeatable and can be compensated for.